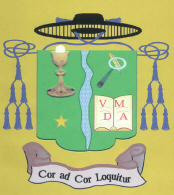 Monsignor Thomas is "Roman" seminary-trained and ordained in the Roman line of Apostolic Succession through the Right Reverend James R. Judd, Bishop Ordinary of the Heartland Old Catholic Church. Msgr. Thomas was ordained a deacon in 2001 and a priest in 2002. In 2002 he was appointed pastor of Immaculate Heart of Mary Old Catholic Church in Saint Paul, MN, succeeding the parish's first pastor, Fr. Peter Harrington. During Msgr. Thomas' tenure, the young parish had several milestones. These included its first First Communion, the launch of its website, and the introduction of monastic-style seating during mass. 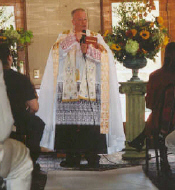 In 2005, after four years as pastor of the parish, Msgr. Thomas founded his ministry of social justice. 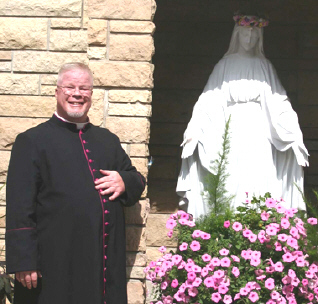 In order to do this and to continue his chaplaincy work with the Ramsey County (Minnesota) Sheriff's Department, Monsignor Thomas stepped down as pastor of the parish. He continues to serve the parish as Pastor Emeritus and as member of its board of directors. He celebrates mass at the parish on Christmas and Easter and other times during the year. You can read about Msgr. Thomas' social justice ministry here. His work as a sheriff's chaplain, which earned him an award, is described later on this page. Apostolic Line of Succession of The Right Reverend James R. Judd. Monsignor Thomas was ordained to the priesthood through the Apostolic Line of Succession of The Right Reverend James R. Judd. The Apostolic Succession is that line of bishops that stretches back to Our Lord's calling of His Apostles. It is from the Apostolic Line of Succession that all validly-ordained priests (be they Roman Catholic, Eastern Orthodox, Anglican, or Old Catholic) have received their priesthood and may administer the sacraments. For most Roman Catholic and Old Catholic bishops, the written record of their Line can be traced back to 1541. It is from this Line that Msgr. Thomas received his ordination to the priesthood. Msgr. Thomas' bishop is Bishop Judd, who leads the Heartland Old Catholic Church (an Old Catholic community in the Midwest United States). He ordained Msgr. Thomas to the priesthood in 2002. This web page shows Bishop Judd's Apostolic Line of Succession. Msgr. Thomas is considered a delayed vocation because he comes to ordination later in life, after serving in several public service and private fields. His history includes time as a law enforcement officer, as well as a civilian investigator in the areas of civil rights, animal welfare enforcement and training, victim advocacy, and paralegal investigations (civil and criminal). Born in a small county seat in southern Minnesota, he went on to receive his BA from Drake University. He is a Vietnam-era veteran and studied theology at Sacred Heart School of theology in Hales Corners, Wisconsin and Washington Theological Union in the District of Columbia. Msgr. Thomas believes strongly in volunteerism within the community. His own service includes serving as a chaplain with the Ramsey County Sheriff's office. In this role he responds to police and fire emergencies as needed while on 24-hour on-call duty for a week at a time. Msgr. Thomas blesses a sheriff's water rescue boat before it begins its search and recovery of a student diver lost during training, 2005. The duty of a sheriff's chaplain is first to be a presence to and for the Sheriff's department personnel, both sworn deputies and civilian employees. That presence may include counseling, assisting at marriages, funerals, and family crises. In addition, the chaplain assists the public by providing death notifications as a lead member of the Sheriff's team, assisting families and individuals after catastrophic fires, and counseling fire personnel. 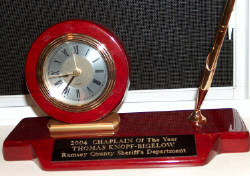 "Chaplain of the Year" awarded to Msgr. Thomas by the Ramsey County (Minnesota) Sheriff's Department in 2004. The chaplain is a liaison with the Red Cross and the Salvation Army in major emergencies. Chaplains also stand ready to assist other fire and law enforcement branches in mutual aid or back-up outside Ramsey County, if requested. Recently, Msgr. Bigelow has volunteered to assist the Pro-Búsqueda program of El Salvador. Learn more. Pro-Búsqueda's purpose is to locate children who were orphaned and dispersed during the brutal years of dictatorship in El Salvador. Monsignor is using his experience as a civilian investigator to locate and contact such children (now mostly adults) who were adopted by U.S. families. If they wish, Monsignor helps them re-establish ties with their biological families in El Salvador. Msgr. Thomas is the former and first Chief Investigator of Minnesota Federated Humane Societies, the statewide society given legislative authority to investigate and assist in animal abuse investigations for the state of Minnesota. For the last several years he has also worked with the Minnesota Fire Fighters Museum as a Fire Motor Operator, driving a 1969 Persch fire engine, designated "MFD Spare One". He is currently the fire chaplain to SPAAMFA, the antique fire apparatus society associated with the museum. 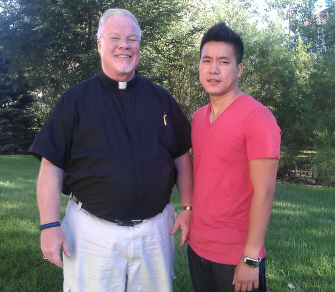 Below is Monsignor with his adopted son, Vinh X. Tranh. In addition to two nephews and two nieces by blood, Msgr. Thomas is an adopted uncle and great-uncle to thirteen children of his close friends who, according to Vietnamese custom, have adopted him as family. Dearest to his heart, he has been named "Grandpa #3" (another Vietnamese custom). 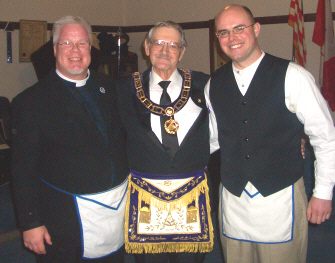 Below: On March 18th, 2006, Monsignor was raised to the sublime degree of Master Mason at Anoka Lodge #30. With me are the Past Grand Master of Minnesota Grand Lodge, WPM Rod Larson (center) and Monsignor's fellow classmate, Ty Kody. 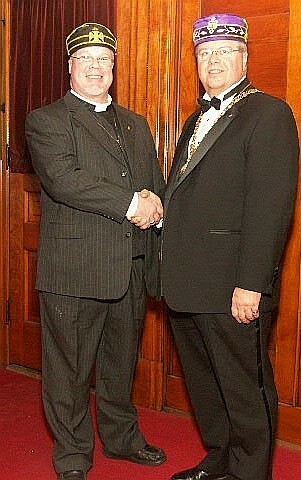 Below: In the Fall of 2006, Monsignor Thomas attained the 32nd Degree, Ancient & Accepted Scottish Rite, Southern Jurisdiction. Congratulating him, right, is Jerry Oliver, Sovereign Grand Inspector, Minnesota Orient, Scottish Rite. Also shown is the coat of arms of the 32nd degree, Scottish Rite. Below: Monsignor's new best friend, Ella.